Setting up RN-42XV Bluetooth and RN-XV Wifi XBee format modules on SparkFun's FioV3 Arduino board. 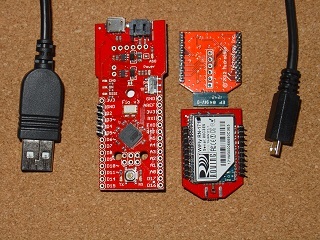 XBee format modules on SparkFun's FioV3 Arduino board. Warning: Do not turn ON the Fio V3 board switch if both the USB and battery are connected. The switch connects the USB 5V directly to the Lithium Ion Battery causing it to over charge. The battery becomes unstable if charged to higher than specified voltage (typically 4.2V). Cutting the SJ2 link avoids this problem, but means you can no longer power the board via the USB. Warning: Do not run the standard Arduino BLINK example code, or any other code using pin 13 (LED) as an output, on the Fio V3 board when a battery is connected. You may damage the board. 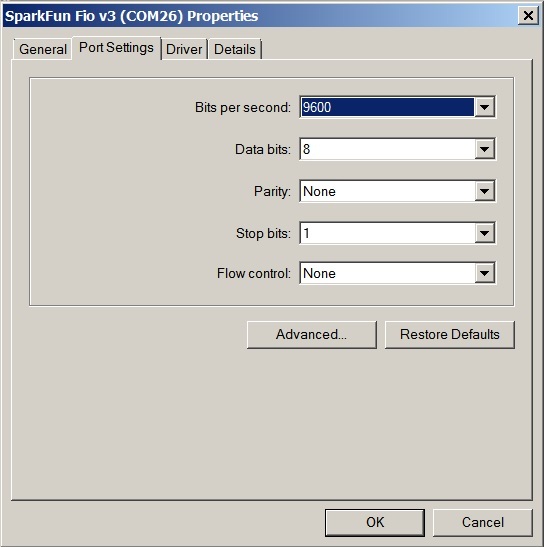 Using FioV3 with Arduino V1.5.5 and V1.5.8 – The addon files provided by SparkFun (as of 31st Dec 2013) do not work. For Arduino V1.5.5 download this sparkfunFioV3_1.5.5.zip file and unzip it to the Arduino/hardward directory in your Arduino 1.5.5 installation. See the included README.txt for more details. 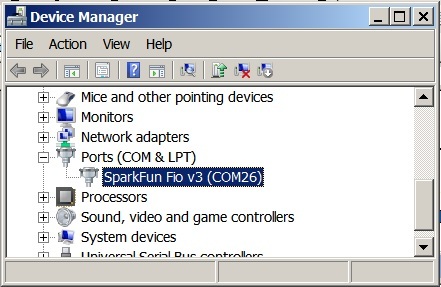 For Arduino V1.5.8 download this sparkfunFioV3_1.5.8.zip file and unzip it to the Arduino/hardward directory in your Arduino 1.5.8 installation. See the included README.TXT for more details. Entering the RN-XV wifi configuration. 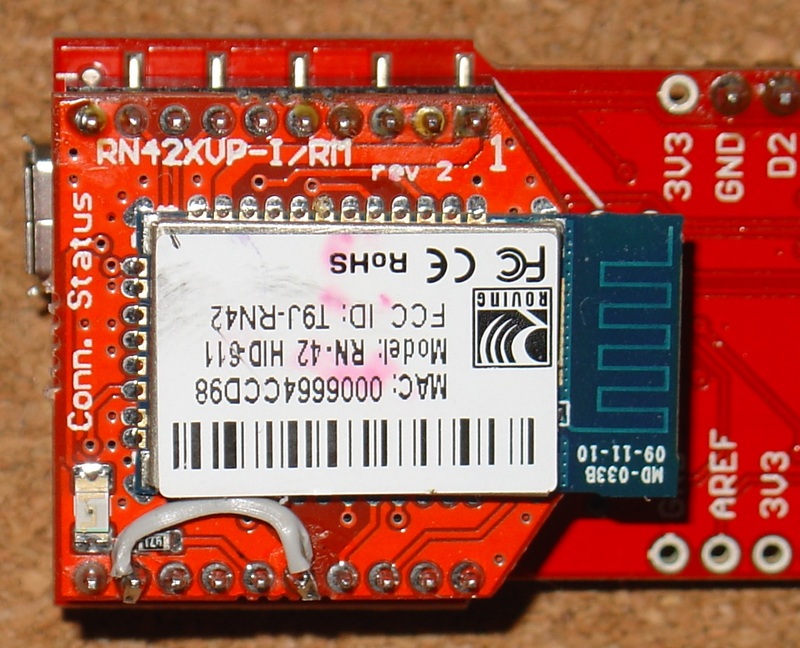 This page covers setting up the RN-42XV bluetooth and RN-XV wifi (XBee format) modules on the SparkFun FioV3 Arduino board. These images show the top and bottom views of the FioV3 board and the two modules. See below re wire link on bluetooth module. As well as the FioV3 board and the module you want to configure you will need a MicroUSB cable. c) USB powered lithium-ion battery charger. e) Serial UART (separate from the USB), Serial1. This simplifies debugging. ii) Pin 13 (the stardard LED pin) is connected directly to the STAT output of the on board Li-ion battery charger chip. If a battery is connected to the board and you load a sketch that drives the LED, pin 13, then you may damage the micro-processor or the battery charger chip or both. Other Arduino boards have a current limiting resistor between pins that can both be set as outputs. Fio V3 has no such protection. iii) The battery monitor resistors are permanently connected to the battery even when the board is turned off. This continually drains the battery if you use the battery powered option. iv) Not all the XBee socket pins are accessable via test points. v) The XBee Pin 1 lable on the FioV3 board is actually next to pin 20 of the XBee socket. Point i) Carefully cut the SJ2 link to disconnect the USB voltage from the RAW lead. The down side is that the board will not longer be powered from the USB so you will need to connect a battery. Point ii) cannot be easily fixed. DO NOT set pin 13 as an output!! Point iii) can be 'fixed' by removing, carefully, resistor R14. Point iv) will be discussed below. Point v) is just confusing. To get this module to work, some soldering is required. 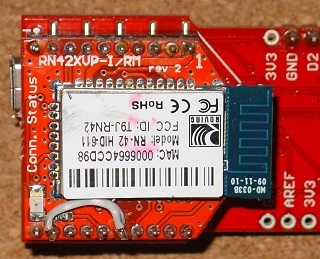 The RN-42 module swaps the CTS and RTS pins when compared to the standard XBee board. The FioV3 only provide access to the XBee CTS pin (pin 12) and does not provide a test point for pin 16, the XBee RTS pin. This is fine for XBee plugins but for the RN-42 bluetooth board, which by default comes with hardware handshaking enabled, it means you will get nothing back as the CTS pin (pin 16 on the RN-42) is not pulled low. With this wire in place, CTS will be pulled low by RTS whenever the bluetooth board wants to send data. Once the wire is in place you can plug the RN-42 bluetooth daughter board in, as shown above, and configure it. To set up the Arduino IDE see arduino.cc/en/main/software. After installing the IDE you need to add the driver and hardware files for FioV3 to your Arduino installation. 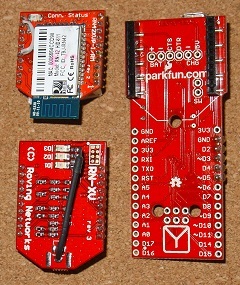 Download them from the SparkFun's FioV3 page and follow the readme.txt instructions included. The FioV3 board is very convenient for configuring the daughter boards because the serial UART connected to the XBee socket is separate from the UART interface to the USB port. This means you can use a simple sketch to connect to and configure the daughter board. There are two similar sketches FioV3_2Serial_115200.ino and FioV3_2Serial_9600.ino. You can right click these links and save them to open in the Arduino IDE or just copy and past the text into an empty sketch. The first one, FioV3_2Serial_115200.ino, works with the bluetooth board in Factory Default 115200 baud rate. The second sketch, FioV3_2Serial_9600.ino, is used once the bluetooth's baud rate has been change to 9600 (see below). Checking the USB drive's baud rate. NOTE: The baud rate for the USB driver does not seem to have any relationship to the FioV3 USB Serial baud rate. 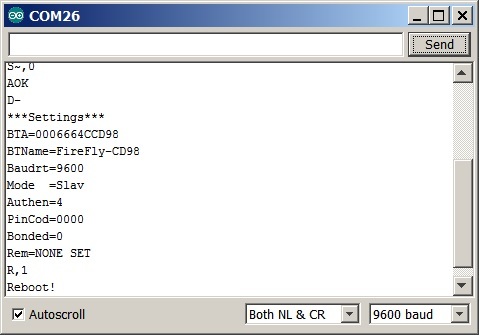 However for consistency, in the sketch the UBS serial (Serial) baud rate is set to 9600, and the Serial Monitor is set to 9600 and you should check that the USB driver is also set to 9600. Here I am goint to set the RN-42 bluetooth module to 9600 baud, SPP profile, Pin Authenication and the pin code, and Slave mode. Check Bluetooth-RN-UM.pdf and RN-HID-User Guide-1.1r.pfd for all the options. Check the www.rovingnetworks.com for the last versions of these documents. Load the sketch FioV3_2Serial_115200.ino and program the FioV3 board. NOTE: If loading the FioV3 fails, check these points. B) The Arduino IDE can see the COM port. Check the Tools menu. If the COM port is missing, unplug and plug the FioV3 board back in to fix this and/or close and re-open the IDE. C) the correct COM port in the tools menu is ticked. Disable bluetooth on your PC to remove a lot of other COM ports. and type in $$$ and click SEND. The bluetooth module should respond with CMD if it does not, the default baud rate is too high. Instead is shows CSTH. Don't worry about this just continue to enter the commands as shown below after changing the line endings back to “Both NL & CR”. This sets the baud rate on the bluetooth module to 9600 and reboots it. Once you have done this you can use the sketch, FioV3BluetoothSetup.ino, to complete the configuration shown below. Copy and past the sketch into your Arduino IDE. Then upload the sketch to your board and open the IDE SerialMonitor within 10 secs to observe the results. Connecting RN-42 bluetooth via Adruino Serial Monitor and FioV3 (if you want to do the configuration by hand). NOTE it is the Serial1 (with a 1 at the end) whose baud rate you need to change. The sketch FioV3_2Serial_9600.ino has this change made, so after the reboot you can just load that sketch and reprogram the FioV3 board to do the rest of the configurations. Now you can continue to enter the other configuration commands. Having changed the baud rate to 9600, here are the other settings I changed. With these changes allow you will be able to connect to the bluetooth module from some other device and send and receive serial data. In my case, I connect from my pfodApp on my Android phone, to the RN-42/FioV3 running as a pfodDevice. Slave mode, in this mode other Bluetooth devices can discover and connect to the device. Configuration timer, ST,0 disables remote configuration and prevents anyone changing the configuration via the bluetooth connection. Prints out the main settings for you to check. That's it, finished. You can now connect to the FioV3 via bluetooth and send and receive data via the bluetooth connection using Serial1 in your sketch. This sketch FioV3wifiSetup.ino does all of the following configuration for you. Copy and past the sketch into your Arduino IDE and edit the ipAddress, localPort, accessPointNetworkName and WPA_key to suit your wifi network. Then upload the sketch to your board and open the IDE SerialMonitor within 10 secs to observe the results. Connecting RX-XV wifi via Adruino Serial Monitor and FioV3 (if you want to do the configuration by hand). This module is much easier to get running. Its factory default is 9600 baud rate, 8 bits, No Parity, 1 stop bit, and hardware flow control disabled. So you can just plug it into the FioV3 and upload the FioV3_2Serial_wifi.ino sketch, open the Serial Monitor and send $$$ with No line ending the RN-XV module responds CMD. Note: the RN-XV wifi module echos back the config commands itself (unlike the bluetooth module above). Another alternative is to wire pin 8 on the RN-XV module to 3V3 on FioV3 to force the wifi module into adhoc mode on power up. You can then connect to the adhoc network via your computer and configure the wifi module via telnet. You need to disconnect your computer from all other networks and then connect to the RN adhoc network (see see WiFly-RN-UM.pdf for the details). Once your computer has obtained an ip address on the adhoc network, this can take a couple of minutes, you can open a telnet session to 169.254.1.1 port 2000. The RN module should respond *HELLO*. You can then type $$$ (no carrage return!) to enter CMD mode and setup configuration below. You can then type $$$ (no carrage return!) to enter CMD mode and setup configuration below. NOTE: If you configure the module a second time, *HELLO* will not be seen on connection, AND you must confiigure the IP number again before you save the configuration otherwise the default 169.254.1.1 number will be saved. 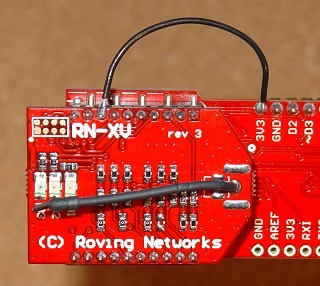 Then to set the RN-XV wifi module up to allow it to be connected to by some client (i.e. pfodApp), I set these configurations (see WiFly-RN-UM.pdf for the details). You need to know the network name SSID and password for your wifi access point and the type of security it uses. In my case my access point uses WPA2-Personal with AES. NOTE: do not use this setting if you want to use adhoc access for later configuration. This disables remote configuration so no one can modify the config with actual physical access to the module. This removes the default *CLOS* message sent on the serial connection when the connection closes. See below for how to determine the connection status via hardware. Omit this setting if you want your Arduino program to be notified with at text msg when the connection closes. This removes the default *OPEN* message sent on the serial connection when a connection is established. See below for how to determine the connection status via hardware. Omit this setting if you want your Arduino program to be notified with at text msg when a connection is established. This removes the default *HELLO* message sent via wifi to the remote end when a TCP/IP connection is established. Once you have finished testing you should remove this message to deny hackers using port scanners any information about what they have connected to. This disables the match char used to send buffered chars. I tried setting 10 for NL (newline) as the char to force the sending of buffered characters, Arduino send CR (\r) and then NL (\n) when println() is called, but found occasionally I lost some chars (this should not happen). Setting to 0 seems to have solved the problem. Setting to 0 (the default) means the buffered chars will be sent when there are 1024 chars waiting (at 9600 baud) in the wifi board OR 10mS has elapsed since the last char have arrived from the arduino board to the wifi's serial connection via the XBee socket. This sets a static ip address for this module. A static ip makes it easy to connect to. Choose some free ip address on your network. You should modify your access point DHCP configuration to exclude this address from the DHCP range so that this address is not automatically assigned to some other device. Setting a high number (.100 to .254) here means it is unlikely to be allocated by DHCP even if you do not modify the DHCP configuration. This disables the DHCP and prevents the static ip address being overwritten. This sets the port the wifi module listens on for a connection. Choose some number between 1024 and 65000. NOTE: After saving this setting when next you want to connect via adhoc you need to set you telnet to connect to 169.254.1.1 port 4989 as only the ip is overridded in adhoc mode. The save port is used as is. 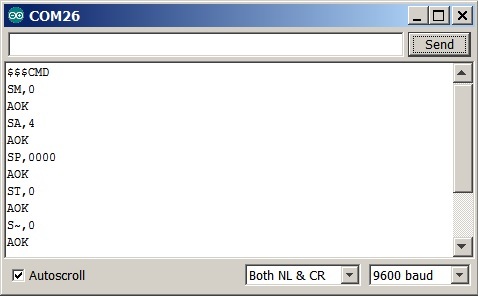 Allow TCP/IP server connections. Do NOT use “set ip protocol 6” if you want to reconfigure via adhoc as setting protocol 6 reject packets whose destination ip address does not match the static address set for this module. In adhoc mode the save ip is replaced with 169.254.1.1 but it incoming packets are still check against the saved ip. The opt password is not set as pfodApp has a much more secure CHAP authentication process which avoids sending the password over the internet. This enables the hardware connection indication. GPIO-6, high = connected, low = not connected. GPIO-6 is connected to the XBee socket pin 15 which on the FioV3 board is connected to ASO led. As described below by wiring the XBee socket pin 15 to a spare digital input your sketch can determine when the wifi module is connected/disconnected. Suppress all the status messages. Set the security setting, in my case WPA2-PSK. Set the secret WPA key. See WiFly-RN-UM.pdf if the key has spaces in it. Set the SSID name of your access point here. See WiFly-RN-UM.pdf if the key has spaces in it. reboots the module using the saved settings. That's if finished. Remove the adhoc wire if you added one (or insert a switch so you can easily switch back to adhoc mode config). On power cycling the RN-XV module should automatically connect to your access point (provide it is in range) and you should be able to connect to it using the ip and port number you set in the config above.